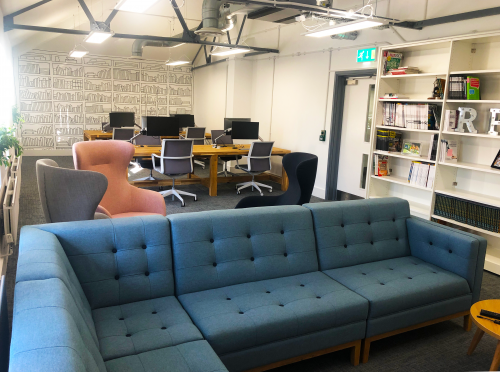 You may have heard the news that the Raspberry Pi Foundation recently took up residence in a new location. And unlike previous offices, the new building offers up more room for members of the team to work and learn, including the yet-to-be-named library. 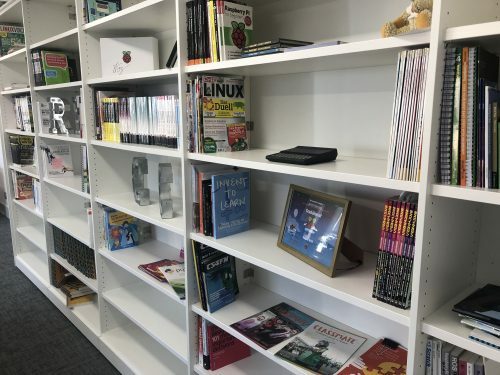 At the moment, the library is home to copies of books written by members of the team, issues of The MagPi, Wireframe, and HackSpace magazine, Project Books, Essentials Guides, and various other related publications. 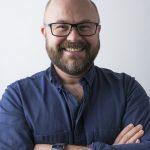 However, on a recent visit in the Foundation office from Raspberry Pi Trading, I was accosted by Foundation CEO Philip Colligan and asked if I could put out the following request to our community. 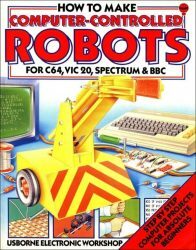 Philip would like to ask you whether you have any old books about coding, such as the classic Usborne series, or aged user manuals or games listings that you don’t need anymore and could donate to our library! This call also goes out to anyone who has written a book about coding and would like to see their work on our shelves. So be sure to include your return address so we can send you some stickers as a thank you for your donation. If you have a book you’d like to donate, please send it to the address below. And if we receive double-ups of any publications, we promise to put them to good use by passing them on to local libraries or coding clubs so that others can experience the iconic books of our childhoods. 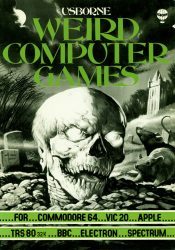 I’ve been hitting atarimania website for old books. I assume that you don’t want copies of those. Anyway my old books are my most precious possession, so you won’t get any from me. However, I’d be interested in having your book titles listed somewhere so that I can look it up, and maybe even buy copies and do further research on my own. I may also be persuaded to write programming tutorials, although that have been SmileBoom Basic for Nintendo 3DS in the past. I’ll probably pick up Fuze Basic for Raspberry Pi, if it comes to that, since it’s coming to Nintendo Switch after all. Great to see this article and would love to donate several programming books to your library. Given today’s postage costs, would local code clubs be in a position to take books for ultimate donation to your library? I have some old Micro$oft Visual Basic and C++ bundled manual that fall into the aged users manuals but I’m not sure if that’s what you’re after. Will these work as examples? I have loads and loads of such books (including ALL of the Usborne collection and the hard-to-find Marvel Super Heroes Coding books – in pristine condition). I won’t be giving them up anytime soon – but I would consider putting them in my will, rather than them going to landfill! However I do have some duplicates so I will consider sending them in. But I would like to know who has access to this library? I would like to think that any interested person would have access rather than just a few employees? I’m in South Africa and have a lot of programming books as well as Linux magazines but how do I get them to you without breaking my bank balance? I have got the entire collection of Acorn User and Micro User magazines from the 1st editions. Would they be any use to you? I did have some Solaris books from the OpenSolaris era but those got sold on Amazon, or binned. Shame Oracle EOLed Solaris – it was a good system. Hmm. Stickers you say? WELL, I GUESS ItS TIME TO GIVE AL OF MA BOOKS TO YOU GUYS…. *whispers* I will give the stickers to my lil bro. I don’t have any books myself, but just had a look on Oxfam site and they have quite a few on offer. So if you have some funds available? It can be quite costly to send heavy books and magazines through the postal system or by carrier. I think you would be far more likely to get donations if you could arrange to pick up from schools or organise a carriage service that is free or low cost. Moving the books to you is the biggest show-stopper that I can see, other than that it is a great idea. What about finding a Raspberry Pi representative in our areas who occasionally travels by car to Cambridge and wouldn’t mind loading up with books? Are you setting up a library or a museum? I’ll dig out a signed copy of my book “Learn Electronics with Raspberry Pi”. 1. The library is part of our new central Cambridge office, which includes a couple of classrooms and a makerspace. The plan is to host lots of events, workshops, training, Code Clubs, and CoderDojos here. As I type this, we’ve just hosted 20+ local cubs who completed their digital maker badges. So the books aren’t just for staff, but not quite a public library either (yet). 2. Great idea to publish a list of what’s in our library. We’ll get onto that soon. 3. What books do we want? Really I’m looking for your recommendations. 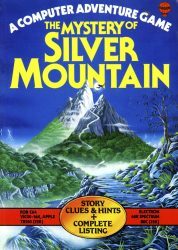 What books have inspired you? What did you find most useful? If you could gift one book to help someone else learn, what would it be? (my current favourite is Grokking Algorithms by Aditya Bhargava – brilliant). 4. Can we pay for postage? We should have preempted this one in the blog post. We can’t agree to pay postage I’m afraid. If the postage costs are prohibitive, don’t worry about sending them to us. Find a local school, CoderDojo, Code Club, or library near you and donate them there. Just so long as they’re being put to good use. 2 book authors I can recommend are Robert Sedgewick and Andre LaMothe. Bob Sedgewick’s Algorithm is much clearer than Don Knuth’s The Art of Computer Programming. But I prefer the old Classic version to the new ones. Andre Lamothe is also very personable, but perhaps not as relevant today since he deals mainly with DOS machine. I also got a lot out of Learning Perl book, the llama book, as well as the CGI book, both by O’Reilly books. I still got a number of well-known SciFis at home, classics, so to speak. Do you still want books? I have got about 30-40 like these and I won’t read them, ever. MagPi 76: our updated Raspberry Pi Superguide!